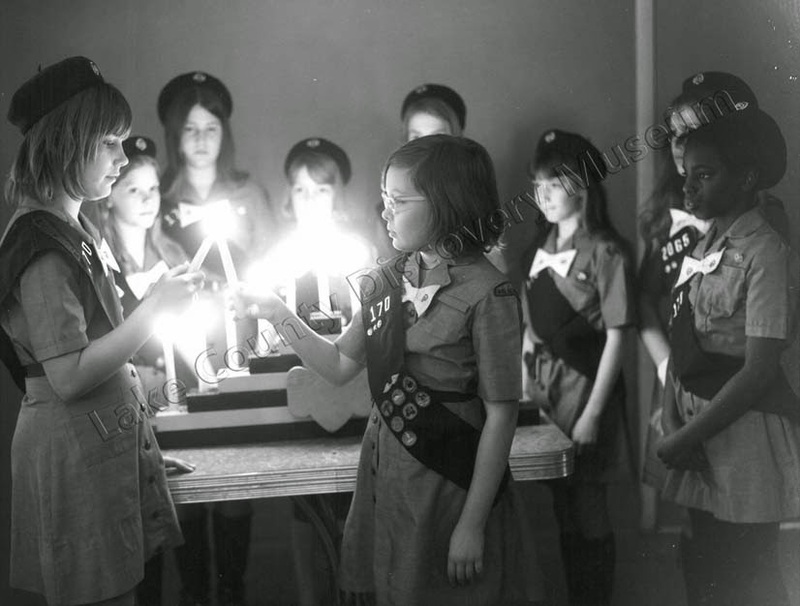 Beyond those in the Scouts or Guides – and their associated groups- Thinking Day is little known. Celebrated every year since 1922, the 22nd of February, or nearest weekend, it’s central idea is that it was a day that members thought about their sisters and brothers originally in Britain but now globally, and the movement’s impact. Another tradition is sending letters or postcards to other Scout and Guides before Thinking Day and of course as this has grown globally the spread has been so that email, tweets and facebook posts have replaced this! “Wednesday 22nd February is World Thinking Day. It is a very important day for Beavers, Cubs, Scouts, Rainbows, Brownies and Guides as it is the birthday of Lord and Lady Baden Powell, Founders of the movement. A number of Emerson Valley School children and staff followed the tradition of proudly wearing their uniforms to school! In 1999 at the 30th World Conference the name was changed from Thinking Day to World Thinking Day and themes were introduced. These ranged from 2005’s Thinking about food, 2008 Thinking about Water but more recently the Thinking prefix has been dropped and themes are just Connect and Grow. In a way it is a shame that Thinking Day is restricted to the Scouting movement – it would be nice for us all to adopt it – we could all do some time to think about others and issues! You might drive past or through Olney and not stop. It is one of countless small towns in the midlands, the backbone of Britain. 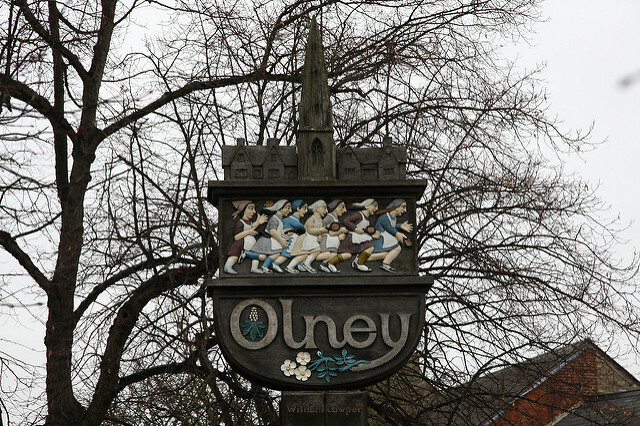 However, some people will pass through and remember that Olney is famed for its annual pancake race – the town sign helps of course. Perhaps the most famous place to do a Pancake Race. There certainly is a great atmosphere on Shrove Tuesday in Olney. Schools close, people crowd the streets around the Bull, and pans are ready. 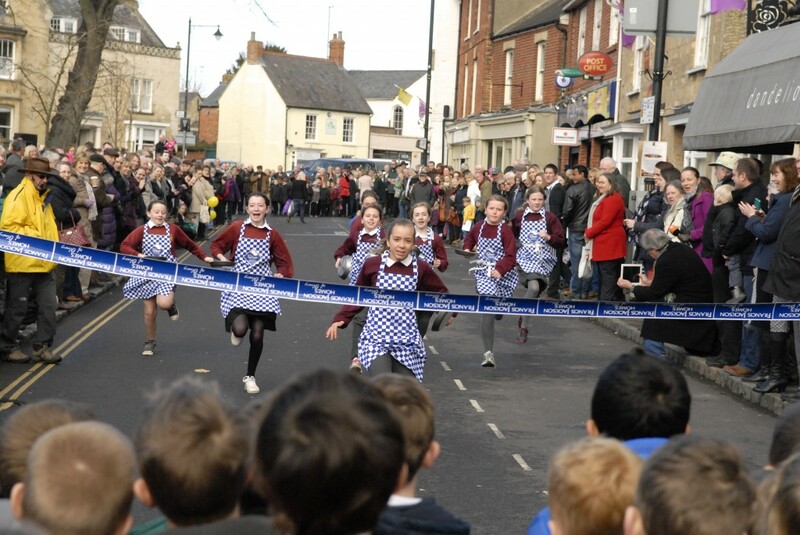 Of course there are many pancake races ran on this day up and down the country, but Olney has a unique feeling. Part of this is due to the dress of its female (the only people other than children) allowed to race – there is no equal opps here I think! No mid race tossing perhaps they are concerned an accident and the pan-ic that might ensue? A local legend is provided to explain the race. It is a common legend in other places. It is said that upon hearing the Shriving Bell, a local housewife too busy cooking rushed to the church carrying her frying pan. Ask a resident of Olney and they’ll say that it was first run in 1445. Others claim that it even took place during the War of the Roses in the late 15th century. They claim that it has lapsed over a number of years….but sadly there is no evidence! Although the weather statement is! What is fairly certain is that the Reverend Canon Ronald Collins in 1948 revived the custom after finding some old photos of the races from the 1920s and 30s. He appealed for volunteers and that year thirteen runners ran on Shrove Tuesday. Going beyond this becomes more more and more difficult. Steve Roud (2006) in The English Year states that it is believed that the custom begun just before the First World War, then lost, then revived in the 1920s, then lost. An article in The Times from 1939 is apparently the first to describe the race and records it was revived 14 years previous. However, one cannot go back further than this and it is significant that no notable historical research writer on days gone make reference to it! What is more likely that like other villages and towns a pancake bell or shriving bell was indeed rung and people confused the tradition. A second race takes place at the same time as Liberal in the US. The race is run on how fast they are but I amazed in this day and age no-one has thought of a video link. Perhaps hologram race in the future. Olney was one of the first such events I attended back in the 90s when I became interested in our curious customs. I haven’t unfortunately been back since but I’d imagine is everyway as flipping fun as it was back then and will forever. Today it is the picture of a genteel Surrey town, bustling with shoppers in and out of shops. On Shrove Tuesday this year it will be much the same as it was the year before. However until the early 20th century each year the streets would be bustling with boisterous boys and blokes ready for a day of street football. Of course Shrovetide football survives still in a number of places of course, but each is subtly different and Dorking’s was no different. The game much as any street football was a mixed game of kicking, throwing and scrumming which was curiously more formalized then others. Kick away both Whig and Tory/Wind and Water Dorking’s glory’. Over the years the event became formalized. It begun at the gates of St. Martin church at 2 o’clock and was played until 6pm a meal was even organized at the Sun Inn afterwards. “Shrove Tuesday football in Dorking: Traders in West and South Streets in Dorking asked the Standing Joint Committee to adopt measures to end the nuisance. Superintendent Page was in charge and reported that he met with Superintendents Alexander and Bryce and with a force of sixty constables did their best to prevent the playing of football. The ball was kicked off by a member of the Town Council and was then seized by the police. 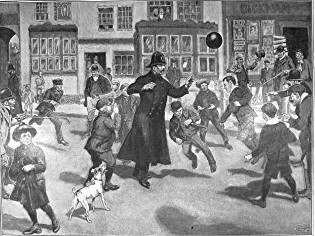 More balls were produced all of which were taken into the possession of the police after a severe struggle. By 5 and 6 o’clock the crowd was increased by a great number of people leaving work, joined in and added to the general confusion. Interestingly, the defence of the participants was supported not only by Dorking Urban District Council who passed a resolution criticising the action of the Surrey Standing Joint Committee but local important people amongst them Mr. Henry Attlee (father of the ex Prime Minister Clement). With such incidents, Surrey County Council were more strenuous in their attempt to supress and in 1907 the streets were silent on Shrove Tuesday. The custom had given up the ghost. It was extinct and was never revived. Sadly, such street football events by their very nature I doubt will ever be revived. So today a walk down the streets of Dorking on Shrove Tuesday will not see scrums of people fighting over their ball…buts let us hope somewhere there might be a small group kicking some ball about!